Medicare Supplemental Insurance Plan K is one of the fastest growing plans according to a 2017 report, increasing in enrollment by almost 30% in 2015. Compare rates for all the Medicare Supplement Plans in your area and run a free rate quote, or call 844-528-8688 and we will do the work for you. Keep reading to see the benefits of the Medicare Supplement Plan K.
Medigap plan K falls into a unique group of Medicare supplements (along with plan L) that offer a maximum out-of-pocket expense limit. This limit, paired with only 50% coverage of many services that are fully covered by other plans, allows Plan K to have one of the lowest average monthly premiums of any Medicare supplement available. 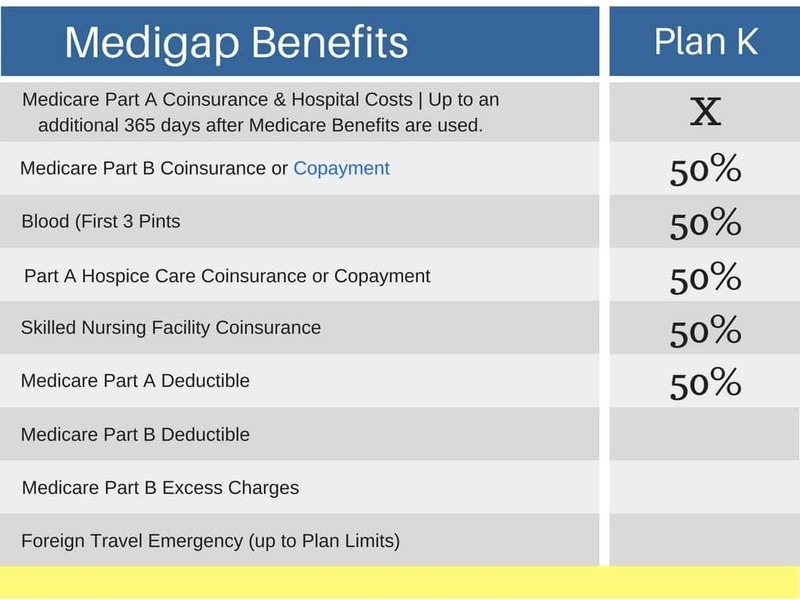 Like all Medigap, Plan K covers 100% of the Medicare Part A coinsurance and hospital costs (up to 365 additional days beyond typical Medicare benefits). However, all of the other benefits are only covered at 50%, meaning that you must pay half of the charges. Medigap Plans K and L feature a unique out-of-pocket limit. This is a guaranteed maximum amount that you will pay for covered health care expenses during the year. Once you have reached your limit, your Medicare supplemental insurance will cover 100% of all remaining charges (excluding premiums). For Plan K, the out-of-pocket limit for 2018 is $5,240. Who Is Medicare Supplement Plan K Best For? Medicare Plan K is a great option for those who are looking to spend less in monthly premiums in exchange for paying a greater share when you do need to visit the doctor. It works well for people who don’t need regular medical care because they are not likely to have a lot of expenses that would drain away the money saved on premiums. If you know that you’ll be making regular use of the services that Plan K only covers at 50%, it probably isn’t a good choice for you. For example, if you think you are likely to be staying at a skilled nursing facility in the near future, you’ll end up spending a lot of money out-of-pocket on coinsurance if you choose Medigap K.
In essence, Plan K is best for Medicare recipients who don’t want to be financially crippled by an emergency situation or a bad turn of health, but also want to save money on premiums. Plans K and L are the only Medigap options that have a maximum out-of-pocket expense limit, and their coverage looks very similar. While they both cover the same services, Medicare Supplement Plan L pays 75% of the charges, and its maximum limit is $2,620 for the year 2018. These increased benefits, of course, come at the cost of higher monthly premiums. The Plan L, therefore, offers a little more in the way of emergency financial protection, but most people don’t find this worth the extra cost. Choosing Plan K can be a big decision because of those reduced benefits. It seems counter intuitive to many people because we tend to think that the sole purpose of Medigap is to eliminate out-of-pocket expenses. However, there is a reason that Plan K is one of the fastest growing plans available.